GRAPHITE, LEATHERETTE SEATING, BLACK OBSIDIAN, [Z66] ACTIVATION DISCLAIMER, [S55] LITERATURE KIT, Window Grid Diversity Antenna, Wheels: 19 Aluminum-Alloy -inc: Machine surfaced finish, chrome plated lug nuts, Valet Function, Trunk Rear Cargo Access, Trip Computer, Transmission: Electronic 7-Speed Automatic -inc: manual shift mode and Downshift Rev Matching. This INFINITI Q60 has a dependable Twin Turbo Premium Unleaded V-6 3.0 L/183 engine powering this Automatic transmission. *This INFINITI Q60 3.0t LUXE Has Everything You Want *Transmission w/Sequential Shift Control and Oil Cooler, Tires: 255/40R19 All-Season Runflat, Tire Specific Low Tire Pressure Warning, Speed Sensitive Variable Intermittent Wipers, Smart Device Integration, Side Impact Beams, Seats w/Leatherette Back Material, Remote Releases -Inc: Power Cargo Access and Power Fuel, Remote Keyless Entry w/Integrated Key Transmitter, 2 Door Curb/Courtesy, Illuminated Entry, Illuminated Ignition Switch and Panic Button, Rear-Wheel Drive, RearView Monitor Back-Up Camera, Rear Cupholder, Rear Child Safety Locks, Radio: AM/FM HD Radio -inc: Bose Performance Series 13-speaker (+7) premium audio system w/genuine metal speaker grilles, Bose Centerpoint surround sound, CD w/MP3 playback capability, speed-sensitive volume control, 2 USB connection ports for iPod interface, flash drive or other compatible devices, Bluetooth streaming audio, SiriusXM Satellite radio w/90-day trial subscription and steering wheel-mounted audio controls, Radio w/Seek-Scan, Clock, Aux Audio Input Jack, Voice Activation and Radio Data System, Proximity Key For Doors And Push Button Start, Power Fuel Flap Locking Type, Power Door Locks w/Autolock Feature, Power 1st Row Windows w/Driver And Passenger 1-Touch Up/Down, Perimeter/Approach Lights. 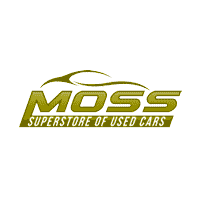 * Stop By Today *Test drive this must-see, must-drive, must-own beauty today at Moss Used Super Store, 1545 SE Evangeline Thruway, Lafayette, LA 70508.